TimeLive reports are generating using pre-defined report data-sources. From these data sources, the user can select/deselect columns which they want to be showed in reports. The user can also define grouping, different summarized functions and custom formulas on all available Datasource columns. These are the report Datasource currently available in TimeLive. For defining report name, report icon, report category and report type (detailed or consolidated). Further, Unique Header and Footer can be described for identification of report during View, Export, or in Print. Different Datasource contains some similar fields but most of the unique ones related to its Datasource to generate the required report. 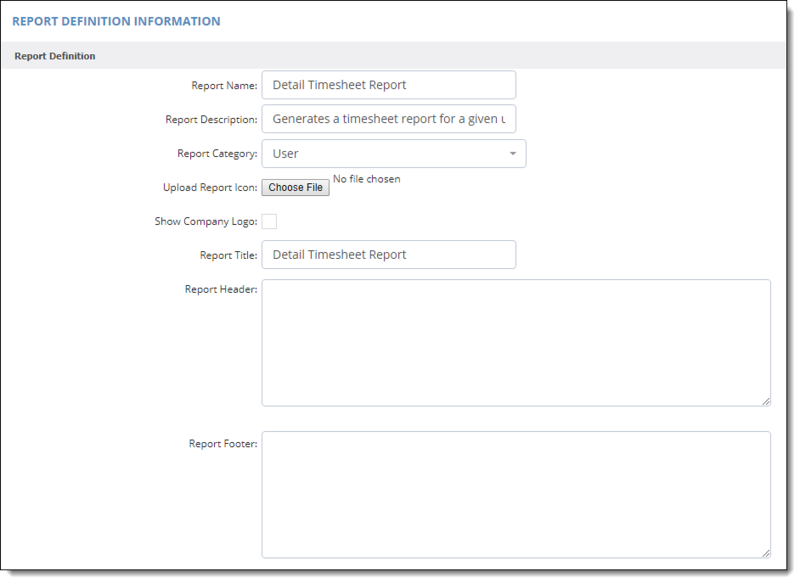 A user can Edit existing Report or can create a new report through this Wizard page according to the requirements. Can select/ de-select Datasource column from the report as per requirement. Can give different Caption for each field according to organization’s terminology. Can select group summary type (sum, count) etc for each report column. Formula Fields (see Formula Column Syntax) and Custom Fields (if defined under Admin Options > Custom Fields see Custom Fields) can be added to extract more customized report. The last page of Report Wizard, there are two tables. Both tables play a crucial part in generating the report according to the requirements. 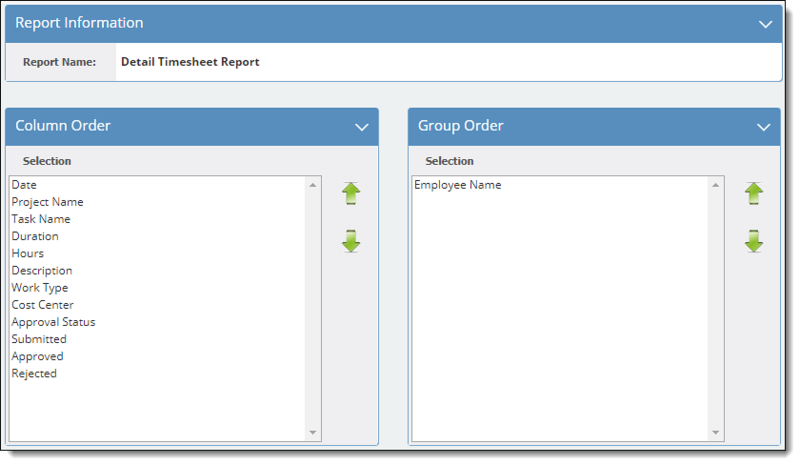 Column Order: Allows the user to set the order of fields in which report view is required. Topmost field will be the first column of the report and the last Field in the order will be the last column of the report. Group Order: If on the second page, Group check is enabled in any field, those fields will be visible in this table. That too can be sorted according to the requirement. In below screenshot, Employee Name was grouped to view Report according to Employee name then the date which is the first field of Column order.